Onions are more than just a healthy vegetable, you can increase your hair growth volume and reverse Grey hair with onion juice when applied to the scalp. Onion juice has been used for hundreds of years to treat thin and Grey hair. 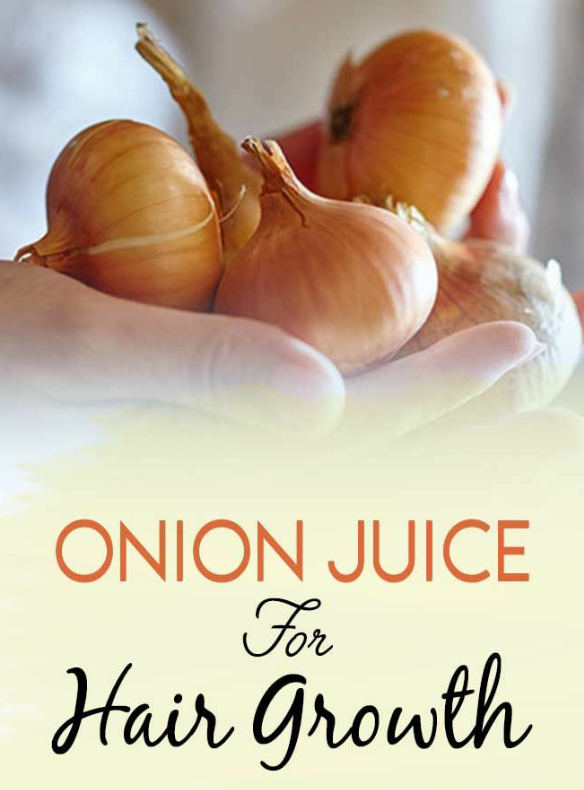 Onion juice induce increase of hair growth and it reverses Grey hair by providing nourishment and circulation to the hair follicles, killing germs, parasites, and is helpful in treating some fungi infections, all of which can aid in prevention of hair loss. Onions high sulfur properties helps in regenerating hair follicles, and are beneficial in decreasing inflammation. It can be used to get rid of Dandruff, because of its sulfur properties. After 4 consecutive weeks of consistent application of onion juice, about 74 percentage of folks with Alopecia aerate experienced significant hair re-growth. Within six-weeks of using onion juice, 84% of the individuals were reported to have Increase hair growth and reverse Grey hair, says studies from Journal of Dermatology. 1. Juicing – Cut the onion into bits and place it into a juicer, then juice. 2. Blender/Food Processor – Prepare your produce, cut them into four-pieces and feed them into a blender, blend together and extract the liquid. 3. Grated – Peel the onion and cut it in half. Grate both halves of the onion over a dish and then strain the mixture to get just the juice. 1. Onion is 100% natural and can’t do any harm to the scalp, but if you are allergic you can water the mixture down with a little water. 2. Apply the onion juice on the scalp and massage, this helps stimulate the hair follicles and allows for maximum absorption. 3. Leave the onion on scalp for about 30mins to 1hr, you can cover up with shower cap while you wait. 4. The smell is usually very horrible, but what u can do is to apply it before bed time. 5. To use onion and honey mixture to increase hair growth and reverse Grey hair. Take one-fourth cup of raw onion juice and add honey to it apply to scalp and massage. 6. Onion is a natural anti dandruff solution: Applying onion juice on scalp for half an hour before washing your hair with a shampoo can be very effective for treating dandruff. 7. Olive Oil and Honey for Treatment of Dandruff: Take small portion of honey and mix into a portion of Olive oil apply on scalp (depending on your hair max), massage thoroughly and cover with shower cap, wash off with shampoo. I didn't know onions are this useful!